CHENNAI: Tamil Nadu is determined to carry forward its fight against use of low quality plastic, considered an environmental hazard. One of the first states to ban use of plastic less than 40 microns thick, Tamil Nadu is now gearing up to ban use of plastic with a thickness of less than 60 microns. A legislation is in the offing to enforce the new standard. Only in February 2011, the Centre banned use of plastic with less than 40 microns across the country. Maharastra and Delhi have already banned plastic less than 60 microns thick, while Himachal Pradesh has prohibited use of plastic less than 70 microns. Concerned over plastic waste wreaking havoc with the environment, the AIADMK government, soon after assuming office in May 2011, announced an ambitious plan to fight the menace by imposing a ban on use of plastic carry bags made of virgin plastic or recycled plastic less than 60 microns thick. “At the behest of the environment department , the Tamil Nadu Pollution Control Board has come out with a draft bill. It is being reviewed by the government. Recycling of plastic will be strictly regulated in future,” said a senior government official . In an effort to get rid of plastic waste, the state even encouraged use of plastic waste to lay 450km of roads last year. But regulations have hardly helped, say environmentalists . They say banned plastic bags continue to flood markets. The ban is effective in very few districts like Nilgiris and Kanyakumari , they said. “Hotels and shops continue to use throwaway plastic that is banned. Inefficient solid waste management leads to cattle eating trash, including plastic waste,” said A Narayanan, a social activist , who moved the Madras high court in 2009 against the menace. Interestingly, the AIADMK government, in its previous tenure, made an attempt to bring a similar legislation , but shelved it soon after. Tamil Nadu Plastic Manufacturers’ Association president S Ganesh said the government need not change the rules. It should maintain uniformity with other states. “The problem of plastics can be solved at the handling stage itself , but we do not do that,” he said. 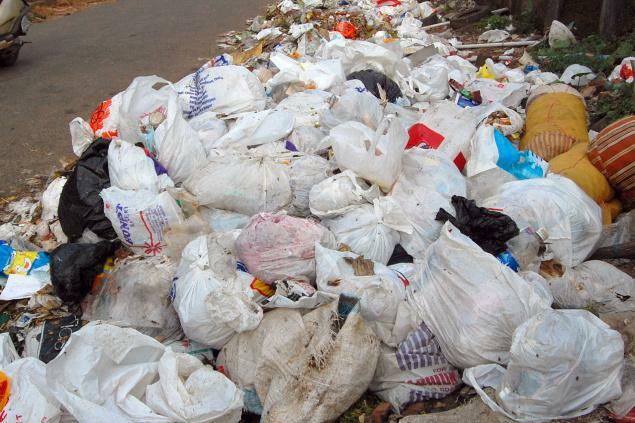 At least 4,000 tonnes of carry bags and throwaway plastics are manufactured in the state. A notification issued by the Union ministry of environment and forests in 2011 banned use of plastic sachets for storing, packing or selling tobacco and pan masala. “Rules are never implemented . Unlike tourist spots like Ooty or Mammallapuram, plastic carry bags with less than 15 or 20 microns are freely available in the market,” said V Srinivasan of Save Pallikaranai Marshland movement.